Far from a convenient power source and your router, your home’s front porch can be tricky terrain for installing a Wi-Fi security camera. Alternative solutions, such as video doorbells and peephole cameras, simplify the logistics of front-door surveillance. 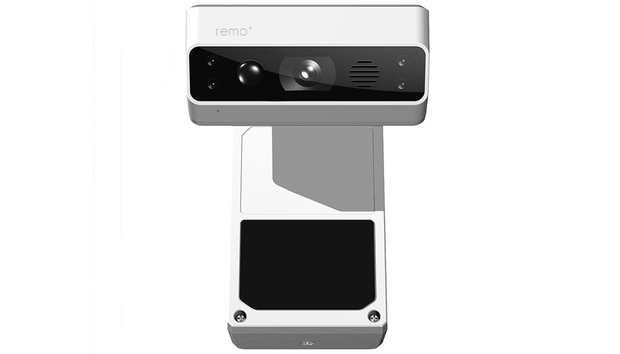 The Remo+ Doorcam offers yet another alternative: This camera hangs from the top of your door, detects visitors and alerts you to their presence, lets you speak with them without opening the door, and records everything in 720p resolution. If you’ve ever used an over-the-door coat or towel rack, you’ll understand the concept of the Doorcam. 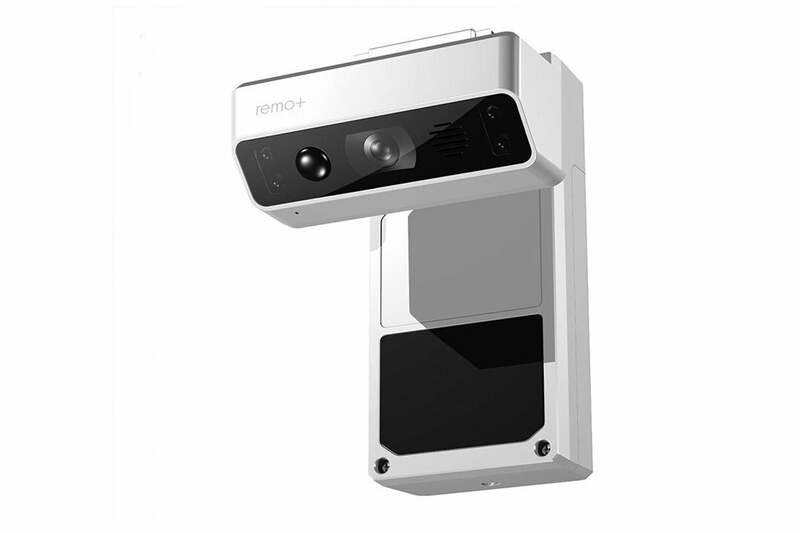 An adjustable metal bracket drapes over residential doors of any thickness, leaving the camera's 160-degree wide-angle lens, a speaker and microphone, and passive infrared (PIR) and ambient light sensors on the outside. The indoor housing contains three D-cell batteries, a Wi-Fi chipset, and an antenna. Remo+ notes this last design element mitigates the connectivity issues that often plague outdoor Wi-Fi cameras and lead to choppy video footage. The Doorcam can be adjusted to fit any residential door. The Doorcam comes with 30 days of free storage for all videos, which can be downloaded to your phone. Compared to typical outdoor cameras, which often require jumping through hoops like finding a conveniently located outdoor electrical outlet or threading cords through a wall to reach an indoor one, the Doorcam is a breeze set up. Just install the supplied batteries and follow the prompts on the RemoBell & DoorCam companion app to connect the camera to your wireless network. If there’s any potential for installation issues, it’s in sizing the camera to fit your door. I was lucky—my unit hung snuggly right out of the box. But the Doorcam’s bracket can be widened to accommodate thicker doors. Using the supplied Allen wrench, you loosen two screws atop the camera, slide the bracket away from the Doorcam body, and then place it over the door. Remove and any slack by pushing the camera body flush against the outside of the door and retighten the screws. Remo also includes some wood screws, so you can secure the bracket to the top of the door to prevent it from sliding.But you'll want to make sure you're satisifed with the product before you put holes in your door (and renters probably won't want to do this at all). The Doorcam records every detected visitor and saves the clips for review. Unlike most security cameras you’d install outside, the Doorcam doesn’t provide a live stream for you to monitor. It simply records a 20-second clip whenever its pair of sensors detect activity in front of your door. As the PIR sensor responds to infrared light emanating from an object, it assures that this activity is produced by a human standing on your porch instead of something like a car passing on your street. When the Doorcam detects movement, it pushes a notification with an audio chime to your smartphone. Tapping it opens a live camera view so you can see who is at the door. “Accept” and “Decline” buttons appear at the bottom. Choosing the former activates the Doorcam’s mic and speaker, so you can talk with your visitor. Clicking decline dismisses the live view. In either case, Doorcam captures video of the visit, which is saved in a timeline on the app’s home screen. When you review these clips, you can share them or download them to your device. Overall, the Doorcam fulfilled its prime directive admirably. Motion detection was unfailingly accurate, and the two-way audio enabled clear conversation with visitors. The video footage had a fair amount of fisheye distortion around objects close to the camera, as you’d expect with such a wide-angle lens, but was otherwise crisp and detailed. Night vision, which illuminates up to about 10 feet, brightened the image up enough to see clearly even without a porch light on. The camera's downward angle often obscures faces, which can make security footage less revealing than you'd need. It’s worth noting, however, that the Doorcam’s downward angle tends to obscure faces once someone is right in front of your door. 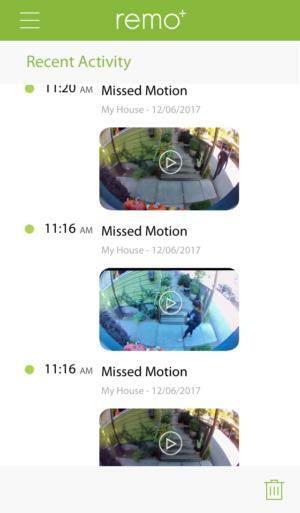 This isn’t of much consequence when you just want to tell a delivery person where to put a package or to turn away a solicitor, and realistically, scenarios like these will make up the bulk of Doorcam’s use cases. 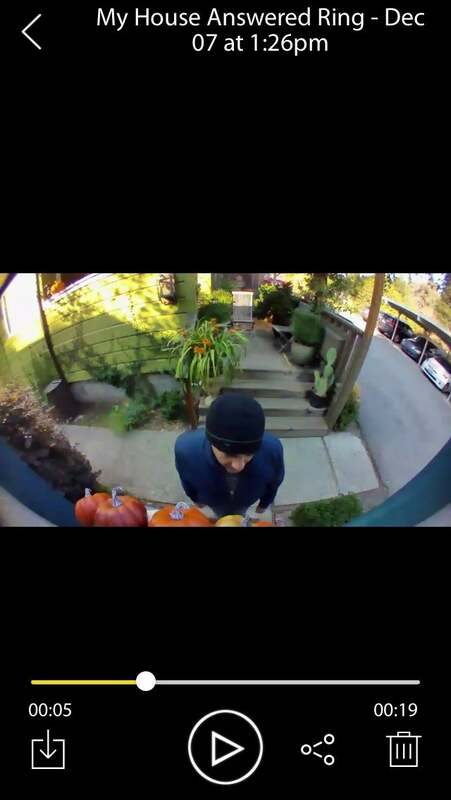 But in the event someone tries to break in or do something similarly shady, the video evidence may not be as revealing as the more eye-level footage captured by the Brinno Peephole Camera or the Ring Video Doorbell . For its part, the Doorcam’s companion app is easy to use and provides no more controls than you need, all found in the Settings menu. These include a battery-life indicator and toggles to customize video resolution, motion-detection sensitivity, and the frequency of push notifications. Is the Remo+ Doorcam a good buy? The Remo+ Doorcam is a clever idea, and if you’re looking for a simple way to monitor visitors and communicate with them whether you’re home or not, it’s a darn good solution. It's not the best choice if you’re more interested in protecting your home from those who would darken your door. Consider that for the same price, you can get a Ring Spotlight Cam, which also comes in a battery-powered model and has higher resolution, greater night vision range, and advanced features such as the ability to set motion detection zones for the camera and the spotlight. With options like that available at the same price point, it behooves you to shop around before deciding.